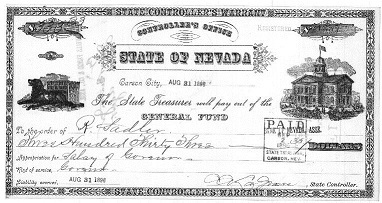 State Controller's warrant paying Governor Reinhold Sadler a salary of $333.00 in 1896. State Archives control number 1896 Warrant. Research services are limited due to a small staff, therefore, it is best for you to visit us to conduct your research. The Nevada Archives is a public facility and open from 9:00 a.m. - 3:00 p.m. Monday through Friday, except state holidays. If, however, you are unable to visit, we will perform a limited amount of research for you. Detailed research questions or a searching for a specific document within a record series is not possible given the circumstances. Generally, this means that staff will identify the series most likely to contain the information requested. Telephone, email, fax, and "snail mail" requests are worked on in the order in which they are received. We do not expedite requests or do "rush" orders. Generally, the research on these requests can be completed in 3-5 business days, but additional time may be required to photocopy and mail the records. Photocopies must be paid for in advance by check or money order. Thank you for your understanding. The individuals listed below have informed the Nevada Historical Society that they are available for employment as private researchers. They are not employed by the Nevada Historical Society and neither they or we assume responsibility for their work. If you wish to use their services, please contact them directly to determine their qualifications and fees. All written inquiries should include a self-addressed, stamped envelope.